Hey all! If you’ve been here to the South then you know a couple of things. You know that our winters are short and our summers are humid. You know that the mosquito is the regional bird of the south. And you also know that there is a Waffle House every 3.5 miles on whatever street you might be traversing at the time. Waffle House is like Coca Cola in the south, it’s a freakin’ institution. Everyone in this area of the world can tell you exactly how they like their hash browns, I prefer scattered, covered, and topped, and even if you don’t like the place everyone has a late night Waffle House story because after hours it’s pretty much the only place open; those bright letters looking like hovering yellow Scrabble tiles bidding you welcome after a late night salsa party or wild night out with friends. Most everyone loves the Waffle House in one way or another, my Dad does, or he did, until they started construction on one less than a mile from my parents’ house. Now he’s not so sure. If you’ve frequented this blog for a while you know that my Dad worries; in fact, it’s almost like he likes to worry. It’s his own little adrenaline rush of sorts; it gets his blood pumping to fret over something. He can be in the midst of a normal conversation about something normal and then – Boom! – there’s something to worry about! Like the Waffle House. I had to run Dad across town last week to go get his car from the mechanic. I hadn’t talked to Dad in a couple of days so the 20 minutes in the car would give us boys a chance to chat it up in the car with some light conversation over his favorite jazz station on the radio. Our ride was going great until we passed the brand new still not opened for business Waffle House on the corner of Memorial and Candler Roads in dear ol’ Decatur, GA. I, for one, am excited about the new Waffle House as it is going to be closer than the one that I used to have to frequent on the off chance I had to make a hash brown run so I thought that I could start a little small talk about liking the idea of having a new Waffle House nearby. Bad idea. Me: The new Waffle House should be open soon, Dad. They’ve already paved the parking lot and finished the inside. Dad: It’ll be closed in a week. Dad: A Waffle House? Here? On this corner? Where do you think knuckleheads will go late at night when they want something to eat? Someone will be shot in a week. Me: Dad, really? This isn’t a bad neighborhood. Dad: You’re right, but bad people have cars and hooligans get hungry and Waffle House doesn’t close. Me: So you think that someone is gonna get shot in a week over a waffle. Dad: I’m not saying someone is going to get shot over a waffle. I am saying someone will probably get shot while eating one though! Dad: They should have opened a mini police precinct in the parking lot. Me: But Dad, all the other Waffle Houses are open 24 hours too. There haven’t been any shootings there. Dad: Maybe, but this one is new, you know how people like to mess up new stuff. Me: So you’re saying that I shouldn’t go there on the off chance I want late night food? Dad: Nope…I’m just saying you should get it “to-go”. I made the right turn into the mechanic’s establishment in Hapeville, GA and there sat Dad’s car in the parking lot to the right. He looked over to it and smiled knocked out of his Waffle Induced Violence Diatribe by the thought of a new transmission in his beloved Ford. I put my car in park and asked him if he needed me to stick around for a minute and he waved me away saying that he just needed to pay the mechanic and then he’d be gone. Then he grabbed his walking stick and started his cool stroll across the parking lot around the corner and out of sight. I sat in the car for a minute still dazed and processing all that was prophesied to happen within the first week at the new Waffle House just a mile from my parents’ home and came to the rapid conclusion that I’d better dine there within that first week or end up being a victim in a hail of bullets over hash browns covered in cheese and chili. After wiping the tears from my eyes, I can now type. That was the most Hi-Larry-Ous thing I have read in a long time. By the way, you dad could never be in the same room with my mom as they would predict the end of days! Keep Writing!! This is too funny! And what’s even funnier is that you will probably become more and more like your Dad as you age, so laugh now. See you at the Waffle House on opening day! LMAO!!! 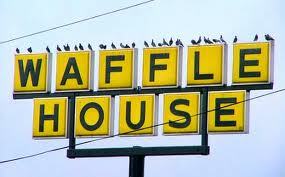 I’d stay away from that Waffle House if I were you…nothing but waffles and trouble in that place! So it’s June and I’m JUST reading this and laughed soo hard I will be reading the rest of your blogs but I have one question? Is the Waffle House still open?